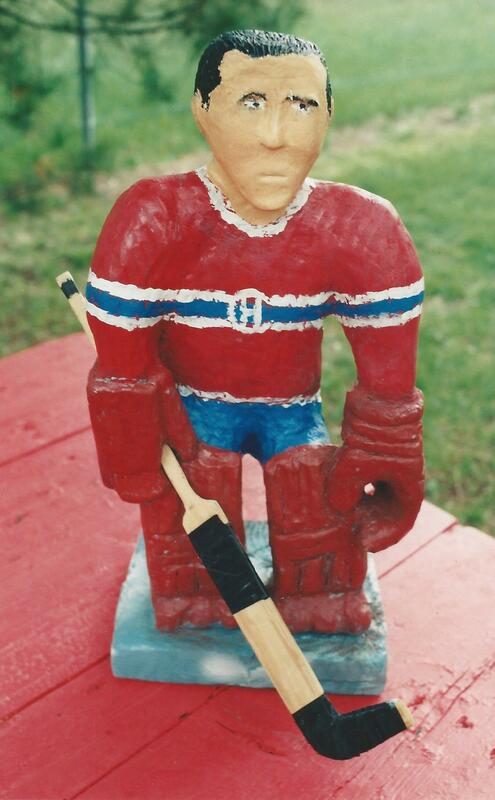 About 30 years ago we were rooting around in Alain Chauvette’s pickers barn near Victoriaville Quebec when we happened upon a wonderful carving of a Montreal Canadien goalie. A serious dude with a square head and a look of determination which would intimidate even the most veteran opponent. 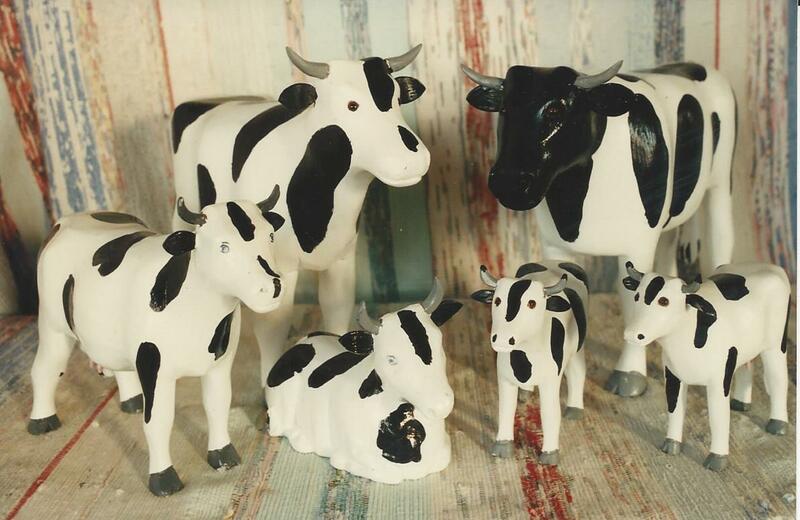 We loved it and bought it for our own collection. I’m looking at him right now and I’m still impressed with the expressiveness of his rough cut features, and the immediacy of the carving. Problem was, he wasn’t signed. 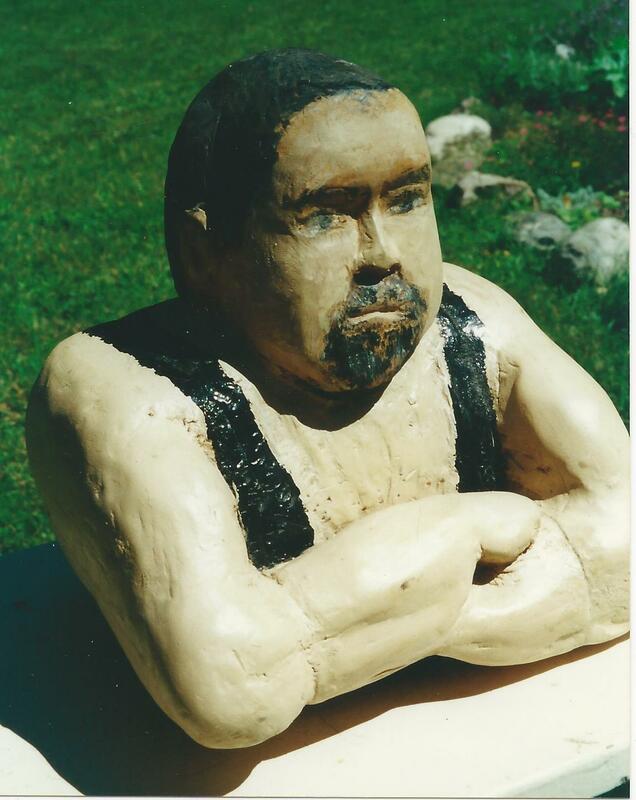 We asked Alain if he knew the carver, and he did not so we had to be content to have found this one great piece by an unknown carver with the possibility of never knowing the maker, or seeing other work by him. 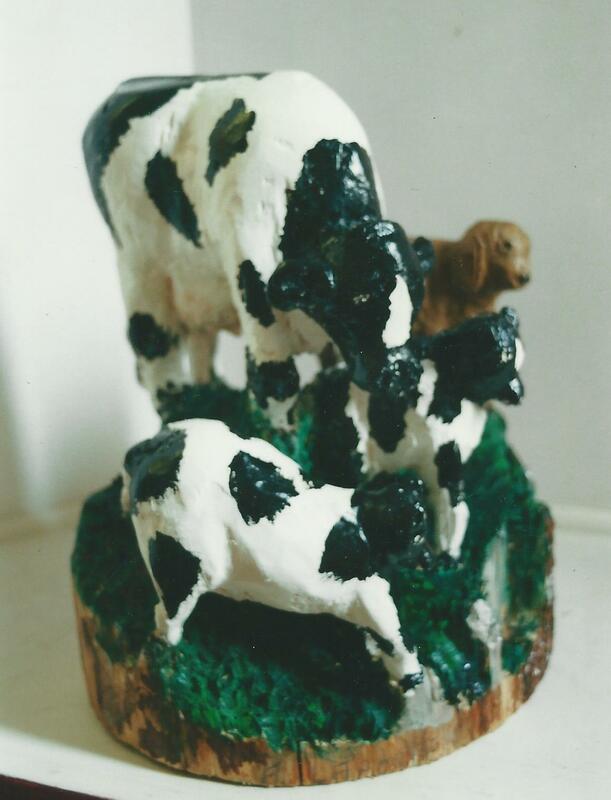 Then about six months later we found a carving that was obviously made by the same hands of a group of four cows, carved all in one piece in the round. The same roughness and directness as the goalie. This time it had the signature A Laporte on the bottom. The picker still did not know the carver, but at least we had a name to go on. So fast forward about fifteen years later. We have found and bought another half dozen pieces by Mr. Laporte, all with the same strength and spontaneity of our goalie. Still no one knew, or admitted to knowing anything about the artist. 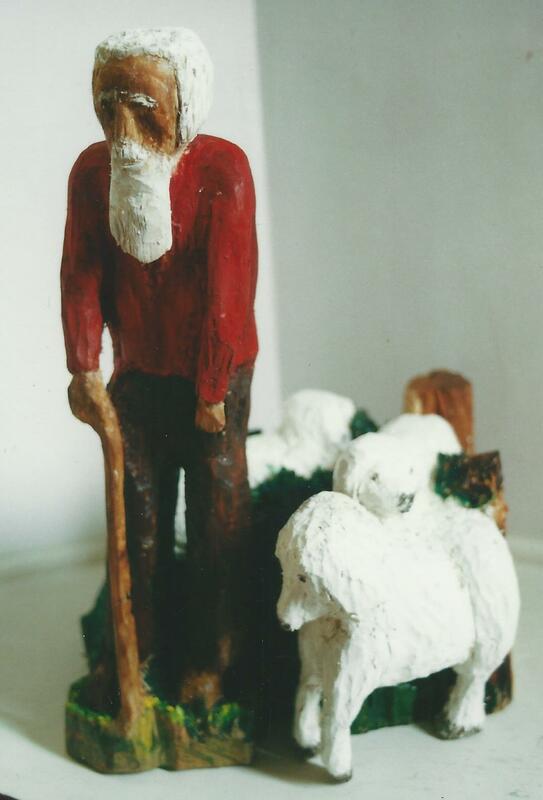 Remember that any picker is extremely reluctant to put you in touch with a carver because then you buy from the artist and not them, so it is counterproductive. Still, we were happy just to find the pieces and realize that the artist was most likely still active. Then came that lucky day when by going through the phone book in La Prairie, and we found and met the carver Leo Fournier. We were enjoying our conversation with Leo when his wife came into the room and said “Leo, Andre Laporte just phoned and I told him I would have you phone him back after you are finished here.” Eureka! 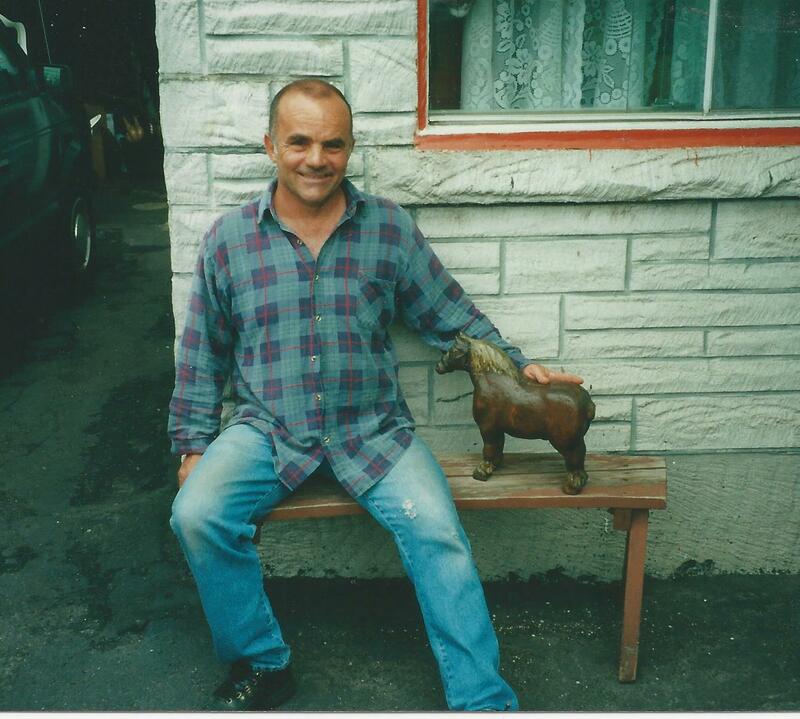 “Would your friend Andre Laporte be a carver by any chance?” Why yes he is, a carver and an antique picker. He lives a few miles from here in the town of Verdun.” “Would you mind giving us his phone number”. “Not at all. I’m sure he would be happy to meet you”. So before we left Leo called Andre back, gave him the scoop and put us on the phone. It was late in the day, so we made arrangements to arrive at his place at 9 the next morning. After getting directions Andre said “No one has ever wanted to meet me before. I don’t have a lot of work to show you so I hope you are not disappointed. “. “Not to worry Andre, we love your work and will be delighted just to meet you , and if you have anything to show us, that’s good too. Next morning after a hearty breakfast we arrived at Andre’s little house by the railway tracks precisely at 9, and there was Andre waiting on a bench by his front door. You could see he was both excited and a little anxious. After exchanging greetings, we went inside and met his wife Lucie. 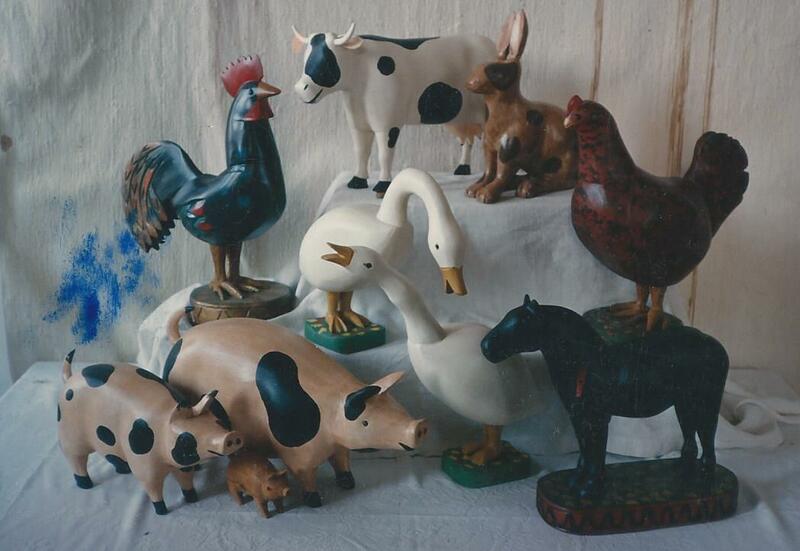 The place was small but filled with nice things including several of Andre’s carvings which were brought out and put on the dining room table. 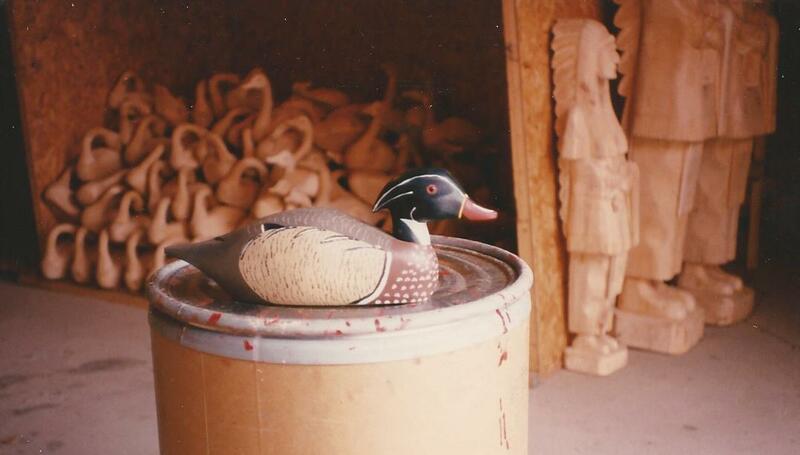 Andre represents what it is to be a natural, instinctive carver. With no training or even having much experience of other work, his work is truly inspired and highly individual. His work deals with what is the pure essentials of his subject. There is always a sense of vitality and movement. 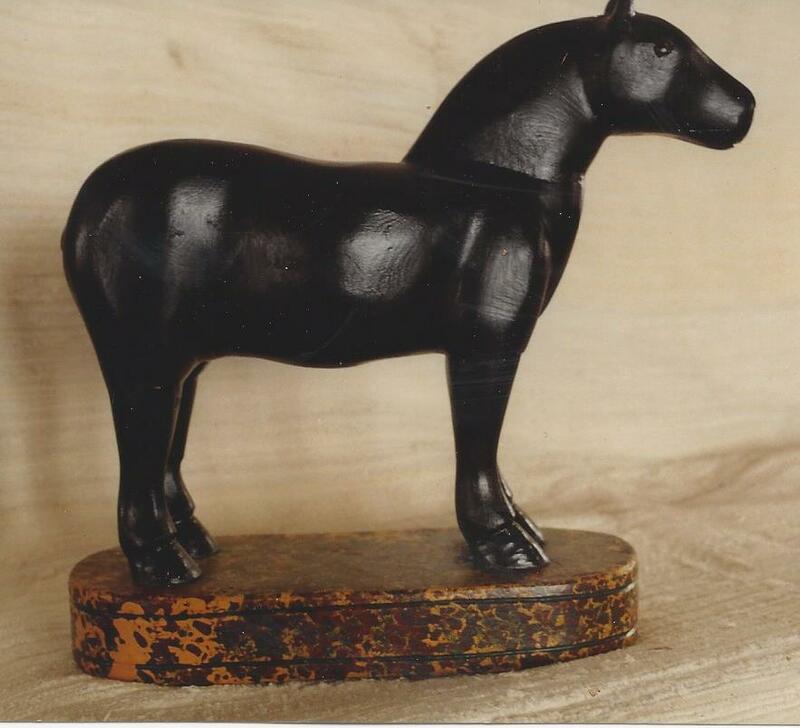 We bought several pieces that day including his first carving of the horse which remains in our collection. We continued to go by Andre’s place a couple of times a year for the many years that we continued to travel to Quebec, buying most of his output each time. Even after we stopped going we would talk on the phone occasionally and he would describe what he had been working on. Often we would send him a cheque and he would mail us pieces sight unseen. Andre and Lucie have a hard life. He was born in Verdun on May 20th, 1948 and has lived there all his life. He has barely eked out a living being an antique picker of the door knocker variety. 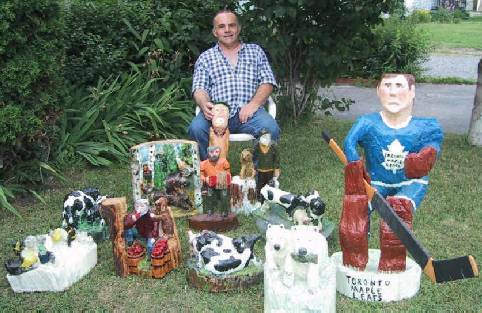 For a while things went well for him when collector Pierre Laplante was buying almost everything he picked, but then they had a falling out and that stopped. Andre and Lucie have three daughters and one grandchild. A few years ago I called to see how he and Lucie were doing and he informed me that sadly one of their daughters had been in a terrible car accident was grievously injured, and that now he had to take her every day to the hospital for treatment. There was never enough money in what Andre does to make a happy and secure life, and I’m sure that without the love and support of Lucie and his family he would not be able to survive. The last time I called was in 2007 when our mutual friend Leo Fournier died. We had a great chat about Leo. How he was his own man, and Andre laughed and summarized it like this “I have always admired Leo. He lived exactly as he wanted to, and never cared what anybody thought. He loved to drink and he died drunk. It couldn’t have been better for him”. I don’t know how things have gone for Leo since. I should phone him. That last time we spoke he said he hadn’t made any new work in a couple of years and he was still mainly preoccupied with helping his daughter to get back to a happy and productive life. He and Lucie are the salt of the earth. I really hope that things are getting easier for them. He has real talent that in a better world would be enough to provide him and his family with a happy and secure life. Unfortunately, it rarely works out like that for artists in the world we live in today. 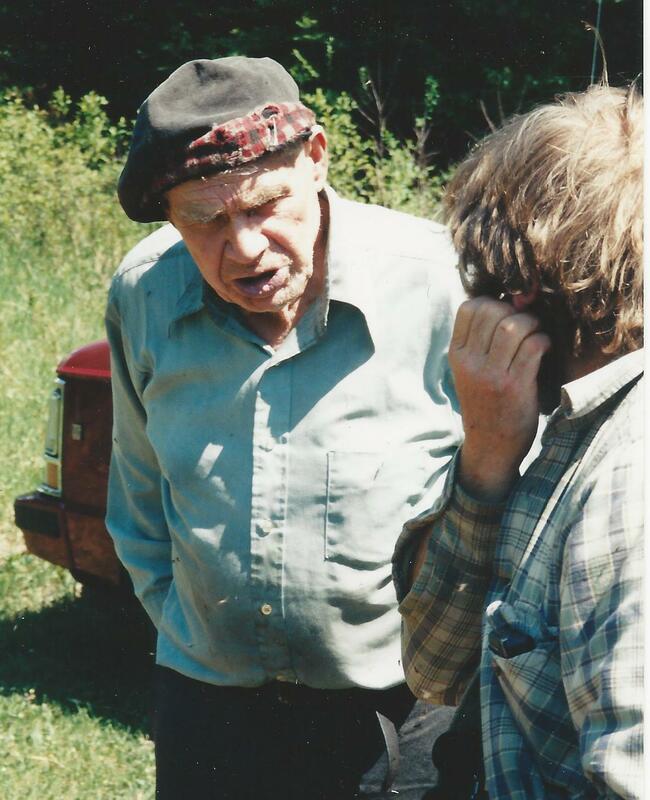 Throughout the nineties I continued to visit Bill when I would get to the Muskoka region. This was fairly often because at the time I was getting a lot of fresh picked stock from Scott Beasley and a couple of other guys in the region. 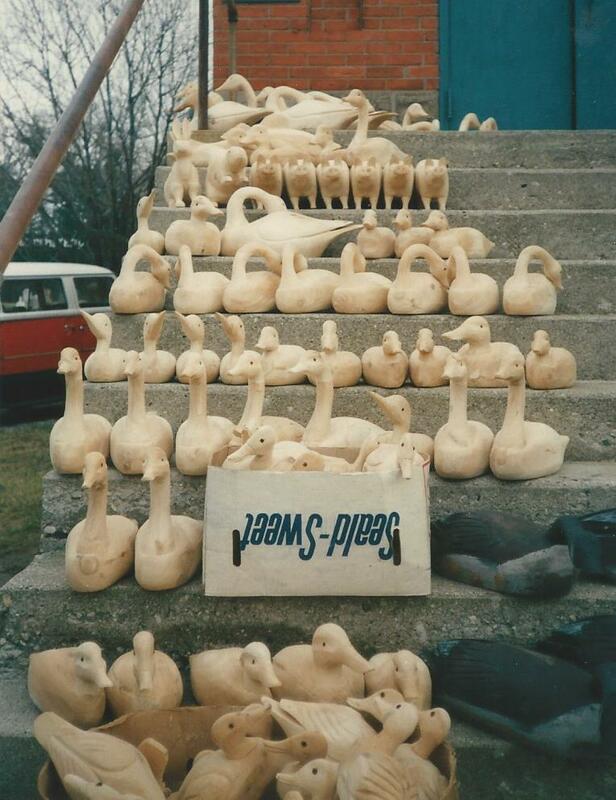 Over repeated visits I was able to buy more of his carvings, just a few at a time, and I got to know more of Bill’s story. Billie Orr was born in Tyrone, Ireland in 1912, but he came to Canada with his parents when he was six months old. 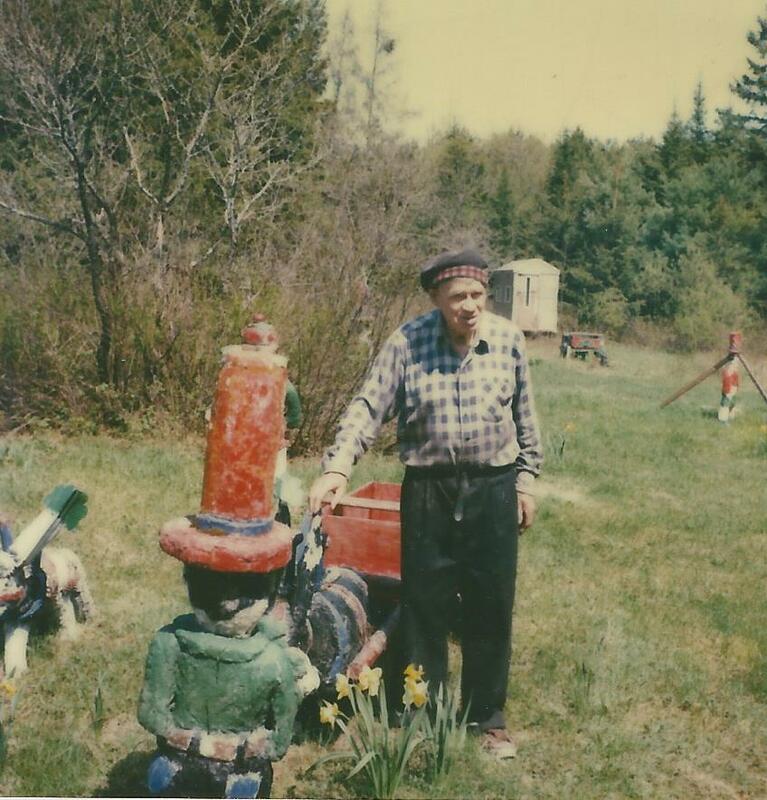 The family settled in Muskoka, and when Bill was sixteen he went to work for the railroad. Then in 1936 he started to work at the Muskoka Sanatorium in Gravenhurst where he was employed for several years as chief engineer. 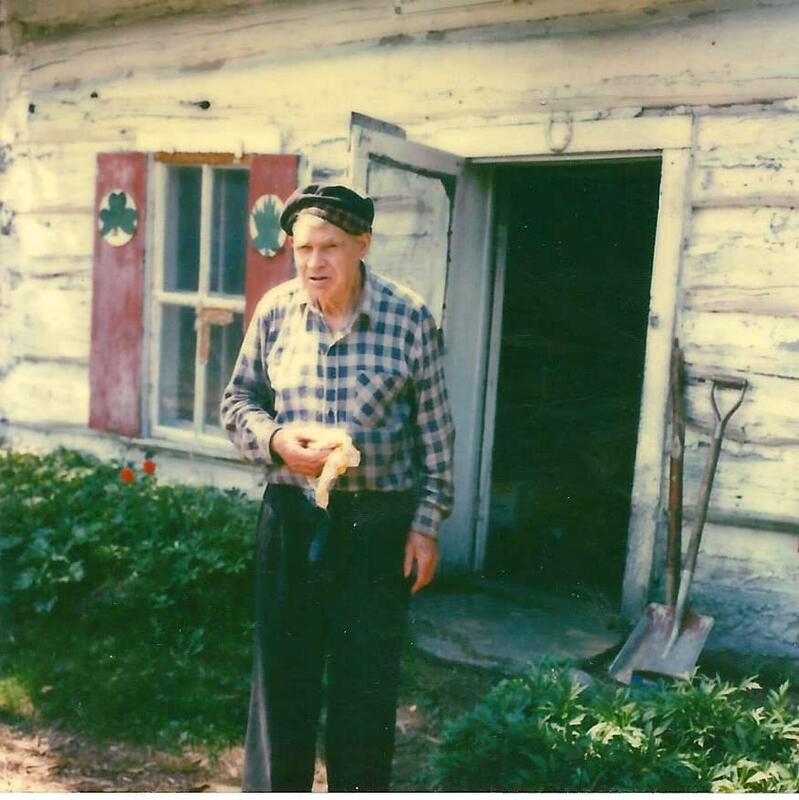 Bill continued to live on the family homestead in a log cabin all his life until shortly before his death in 1998. About fifty years ago Billie planted a tree circle behind his house and started to make Irish and Zodiac figures in cement. He placed his figures within this “magical” circle. He said he did it for the amusement of the moose. 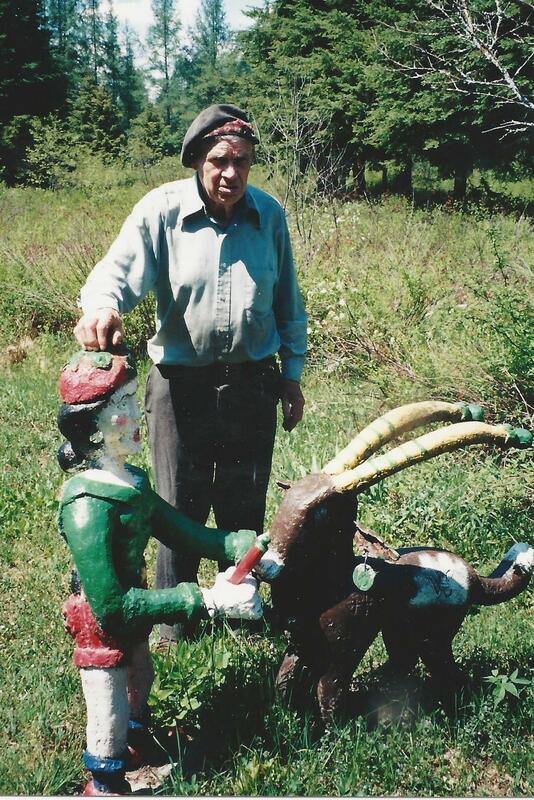 He made friends with and tamed many wild animals. He loved Ireland, and would return many times on his own to travel by bicycle and hike throughout the countryside. 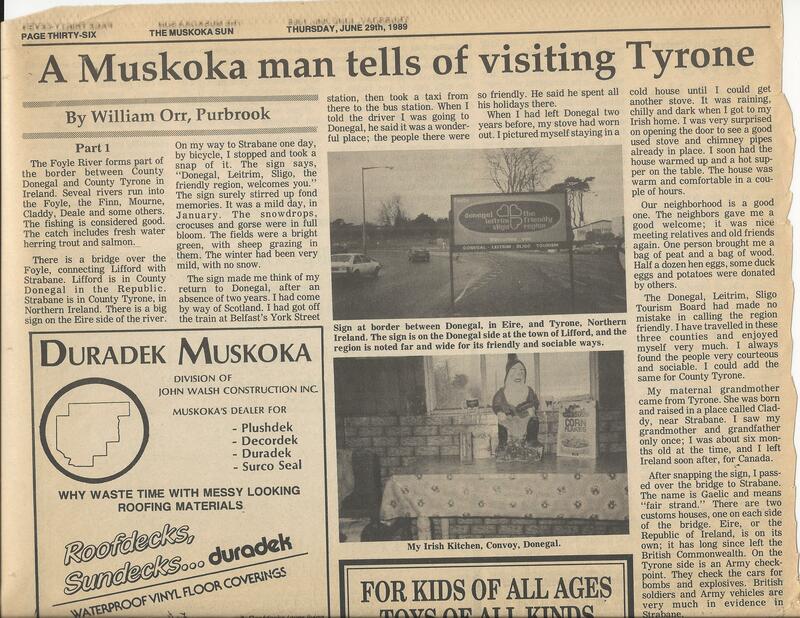 When he returned he would publish accounts of his travels in the Muskoka paper. In the fall of 1997 I dropped by Bill’s unannounced, and for the first time he wasn’t home. I thought I had just missed him and he had gone into town, so I left a note and thought nothing more about it. A couple of weeks later I got a letter from Billie. 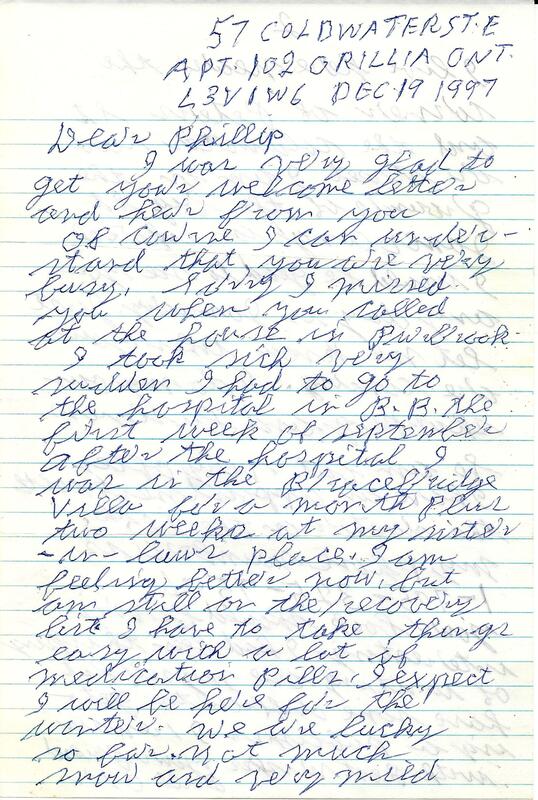 Sadly, he explained that he had fallen ill with a bad heart and that after a stay in the hospital he was forced to move from his beloved cabin into Orillia, where he had a sister in law who helped look after him. He gave me his new address and phone number. It was sad talking to him, because although he remained up-beat, he stated that he would now have to stay in Orillia near his doctor and that he would never again see his cherished home in Purbrook. 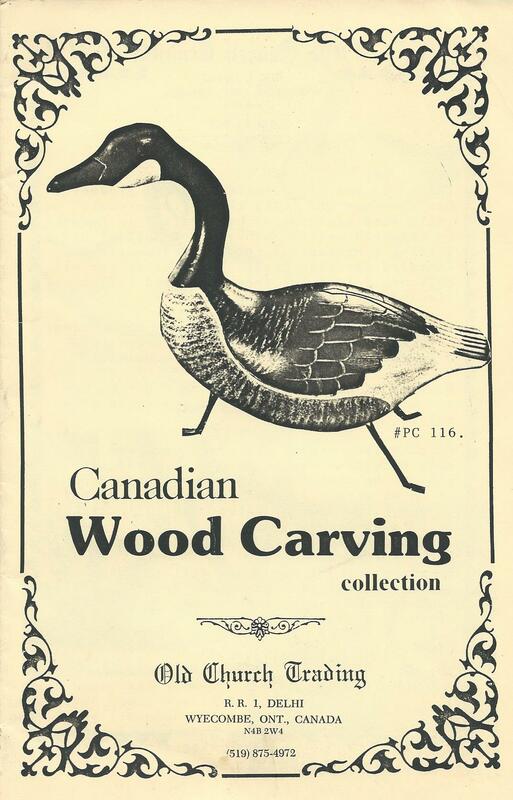 He ended sounding upbeat, and he told me that before the attack he had finished a half dozen new carvings and if I could get up to see him he would sell me a couple. This was in February of 1998. I said I would be up to see him, as soon as the good weather came in the spring. Well, one thing lead to another, and spring came and went and I think it was mid-summer before I was ready to head up north. I called Bill’s number to tell him I was coming. Billy’s sister in law answered. I was shocked to learn that Billie had died not long after I talked to him. I was too late. I felt terrible for missing my chance to have one last visit, but I had convinced myself that he was on the mend. His sister in law told me that the property sold right away and was being developed. I knew this meant the end of the circle of trees, and the magical world of zodiac and Irish creatures. 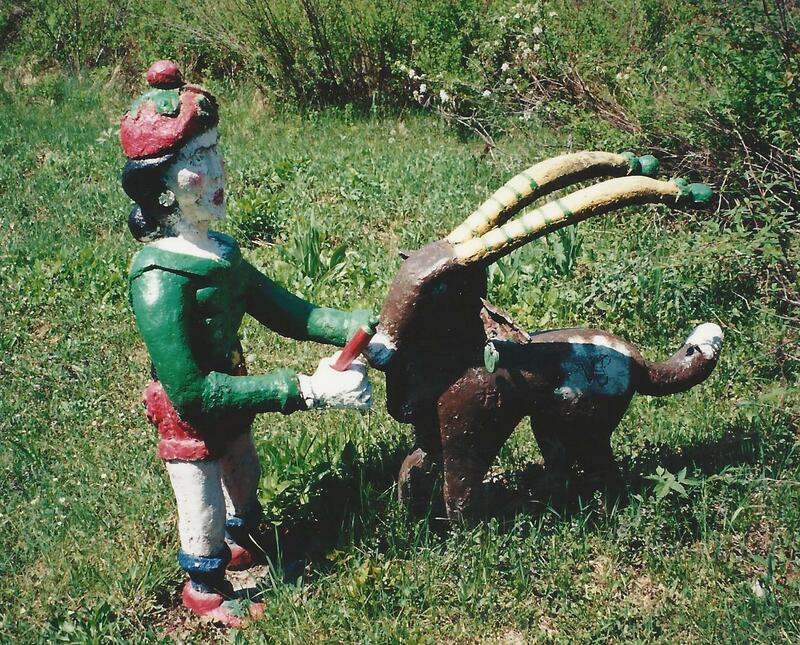 When I had expressed my condolences and hung up the phone, I felt I should rush up there immediately and try to save the concrete menagerie as I feared they would likely get bulldozed into the ground the minute they got in the way. Then I thought about it a bit more and I didn’t go. I knew in my heart that it was too late, and decided I would rather remember it the way it was. I once brought along a VHS camera and taped a visit with Bill. What I must do before it deteriorates is get it transferred to digital and have it as a record. Bill was a special man, and in his own right an inspired artist, both in what he created, and the way he lived. 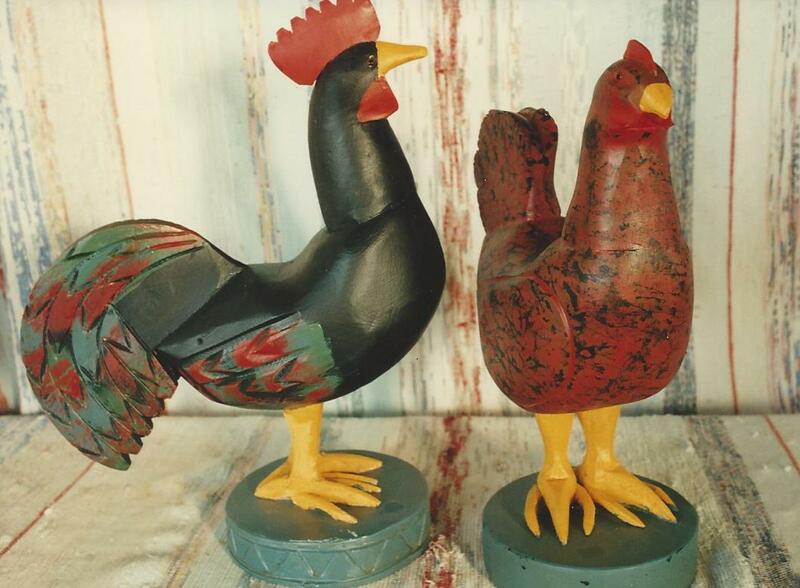 When I did the Outsider Art fair in New York City, I brought pictures of Bill’s place, along with many other examples of Canadian folk art, and showed them to the renowned art dealer, Phyllis Kind. She passed over much of what I showed her, but paused and really had a hard look at Billie’s work. She said “This is interesting. 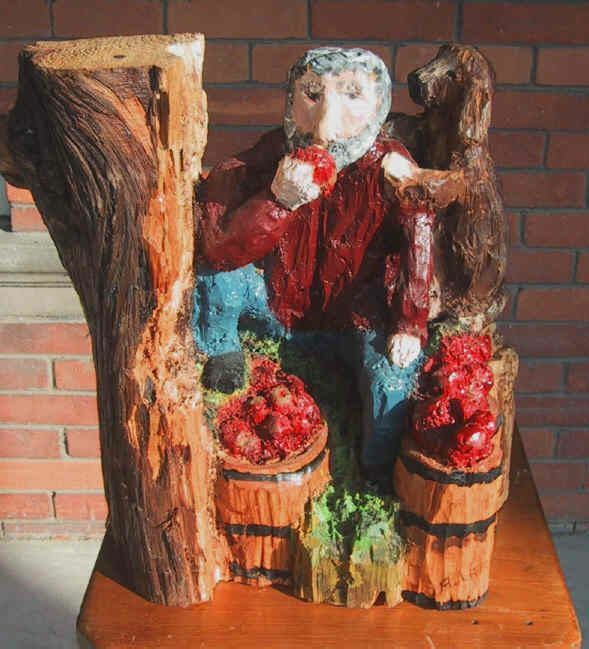 I’d like to know more about this artist.” When I got home I sent her photos, a bio, etc, and after a couple of weeks she phoned me to say that she would be interested if Bill would sell all of the work and she could show it as a reconstruction of Bill’s installation. Naturally she was concerned about the cost of moving all that concrete to New York. I got in touch with Bill but he wasn’t at all interested. I could tell that for him it would be like selling his family. Still, Phyllis is no slouch when it comes to art, and her interest reaffirmed my belief that Bill Orr was an exceptional individual and artist; and he was a lovely man to boot. Thank you very much for the letter and the photos. The Colleen Dubh takes a good photo due a lot to the surroundings, especially the honeysuckle bush. Thanks for the ten dollars. I noticed the error but didn’t want to say anything. Thanks a lot for the correction. Back in the nineties, Billie Orr was a familiar figure in Bracebridge, Ontario. My friend Scott Beasley would see him at least once a week, shuffling along the street carrying his bags of groceries and supplies, as he headed out towards his property which lay about three miles out of town on an isolated craggy, wooded acreage overlooking a river. 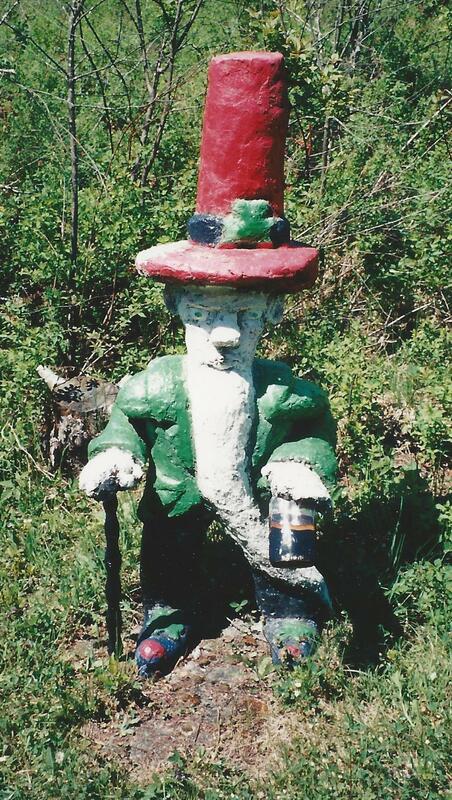 With his perpetual Irish cap, and lower lip which seemed in danger of dragging on the ground, Billy was well known, and universally liked by the locals. Scott took to talking to him, and found out that Billie lived on his own on the property he was raised on, and having a good picker’s instinct, he eventually got Billie to invite him for a visit. What he found was fascinating. A bit later, I happened to be in the area and was interested, so Scott and I headed out one fine summer morning for a visit. Billie lived in a log cabin with no running water and one electrical outlet on a large remote acreage not far from town. It was a pretty funky set up. He had to go down the hill to fetch water, and the cabin looked like nothing had been done to it in several years. We came down the long lane to the cabin and there was Billy standing in the open front door. Although old, and obviously used to living alone, he was welcoming and articulate. He started right in telling us about his upbringing. His father was an inspector on the railroad, and had built the cabin in the first quarter of the century for his wife and Billie and his sister. Billie’s sister moved away. Bill never left. He never married, and never drove a car. He would walk into Bracebridge once a week and get what he needed, which wasn’t much. 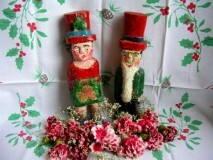 Bill still cut all his own wood, fetched his water, and grew a large garden so he was practically self-sufficient. We were chatting away in the main room of the cabin when suddenly a large mother raccoon appeared at the door. Billie excused himself. “Good morning little mother. As you can see I have guests but I have your breakfast ready for you.” At this he disappears into the kitchen and comes back with a granite plate full of table scraps, and sets it down outside the front door. Mother raccoon made a friendly, grateful noise and set at it. We continued the tour. At the side of the room here was a steep set of stairs which led to the second floor. You could see that the top steps were completely covered in soot, and Billie explained that he had had a fire up there a couple of years back, but had managed to get it out before it destroyed the place. Obviously he was no longer using the upstairs as it had never been cleaned. On the steps there were several small carvings of Irish people and little wheelbarrows which Billy had made some years back with a view to selling them to tourists. I guess he never found a venue for selling them because he had several of them in a row, all covered in a layer of soot from the fire. “These are cool Billie. Any chance you would sell us a couple of them.” “Well, I could sell you one or two I suppose. If you want to buy more, you will have to come back”. I realised that this was Billie’s technique for assuring a future visit. He obviously enjoyed conversation, and “human” visitors were rare. Next he took us out back to show us his other work. 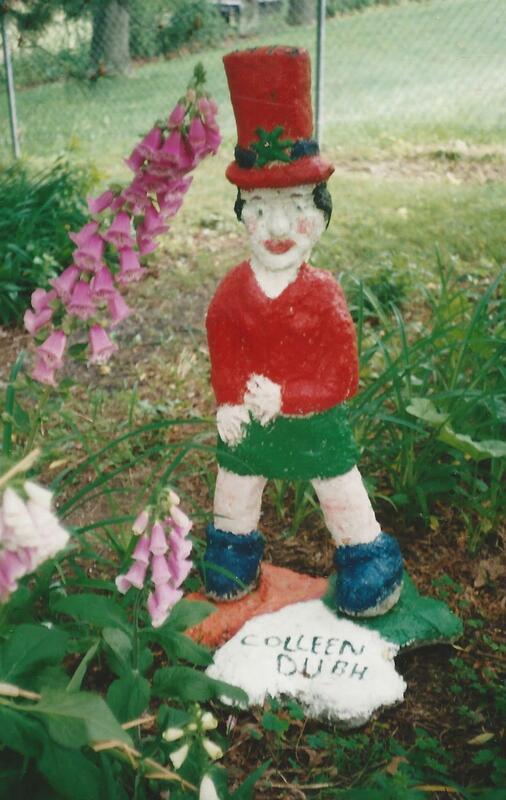 There among the trees stood several hand formed cement figures depicting Irish Leprechauns, and Colleens (young women) and several figures depicting the signs of the Zodiac. Billy explained that he made these free form by placing metal armatures (or skeletal forms) in the sand and then building them up with cement. 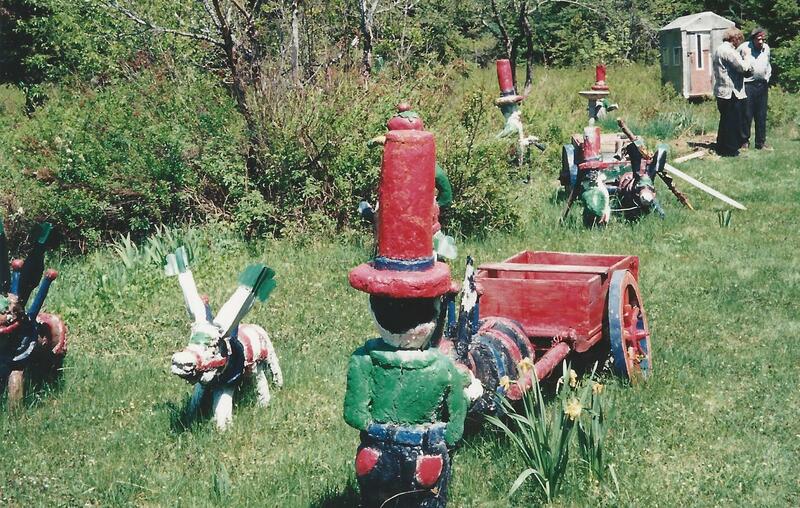 They were all wonderful folk art, and a vision to see in this natural setting. Just behind them Billy had years before planted a circle of trees which grew to a great height and were meant to depict Stonehenge. What an amazing creation. I was awe struck. There is so much more to say about Billie and my subsequent visits that I will continue the story next week in my Friday Blog. Billie was a true “outsider” in every sense of the word, and I am honored and privileged to have known him.